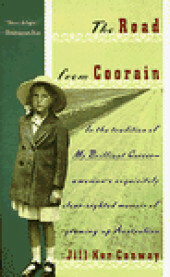 I became interested in reading The Road From Coorain by Jill Ker Conway after watching a Masterpiece Theatre movie based on the book. The story intrigued me and I tracked down a copy of the book so that I might further enjoy the original story. Born in 1934 in New South Wales, Australia, the author grew up on a family owned sheep farm in the sparsely populated western grasslands. Life was difficult on the farm during a prolonged drought where Ker and her brothers learned to run the ranch beside their father. After his untimely death, Jill moved with her mother to Sydney where life was vastly different from the solitary life she’d known previously. At the age of eleven, she entered formal school for the first time. Overcoming a new set of obstacles and tragedies, Ker learned to cope by delving into her studies. She eventually graduated from the University of Sydney and went on to earn a PhD from Harvard University. An accomplished scholar, Ker became the first female president of Smith College. This book is inspirational and encouraging of women seeking to attain and contribute something more in the world than motherhood. I am planning to read Ker’s sequel entitled True North as I am interested in reading more about her life. She is a fascinating, accomplished woman. This entry was posted in Uncategorized and tagged Australia, Books, Harvard, Jill Ker Conway, sheep farms, Sydney. Bookmark the permalink. I read both books about 5 years ago, yes you have to read the 2nd vol, one does not go without the other. what a wonderful woman! and oh the descriptions of Australia in the first vol! I am looking forward to reading the sequel. Thank you for your recommendation of it. I agree, the vivid descriptions of the landscapes were outstanding! I was very moved by this story and admire Jill Ker and her outlook on women’s roles in society.